9 YEARS HAVE PAST AND WE'RE STILL KICKIN'! Today, group Aperion is celebrating 9 years of existance. In this time the idea has come to reality. Year 2011 was a year of opportunities for us. In March we have started as a support for EPICA on almost sold out venue in Ljubljana. Next stop was traditional students party Majske igre and concert on Metal Witch fest in Ljubljana in June. March also brought us a huge break through abroad. Firstly we have signed a contract with G-Records and distribution house Rough Trade and Secondly, the reprint of our debut CD Act Of Hybris has been released in Germany, Switzerland and Austria. We have also received great reviews of our album from all over the world. Our music was also released on 4 compilatons throughout the whole World. The listeners of French La Grosse radio have placed us as second on the chart with names such as Metallica, Slayer, Scorpions, Helloween, Megadeath etc. Just now the German ZYX Records has released new double Cd "GOTHIC SPIRITS No. 14. as a compilation of best gothic artists this year with our song Light included. Positive respones from abroad also brought us concerts in Europe. We were one of 600 artists performing on world known music festival EXIT in Novi Sad, sharing the stage with Kreator. And on 17h of October, Lyon was hosting H'elles on Stage festival, which was absolutely amazing! The crowd was unbelievable and their response was incredible. Year 2011 was a dream come true, Aperion became an established European band! But this is not all from us this year. We have a new music video prepared for a release, some new concerts, interviews and projects. Last but not the least, we would like to say a huge thanks to our team and everyone that played a part on our projects, and of course to you, dear fans! You are our motivation and limitless source of energy. Thank you! APERION AT CELJE, TOMORROW FRANCE! Attention everyone, Aperion debut album with the title »Act of Hybris« is finally in Slovenian music stores! CD on witch you can find 13 songs, amongst them also Black Flies, for witch group is preparing a new music video, can be bought or ordered in Big Bang stores throughout Slovenia, in MCD shop, ZOSO store and in other music shops in Slovenia. You will also have the opportunity to hear them LIVE! The first concert will be on 15th of October, when they'll be playing in Celje. The concert will take place in Celjski dom hall at 8pm. They will be sharing stage with groups Poweršok and MI2. You can find more about the event ot their Facebook page. Aperion has also been invited to H'elles on Stage festival in France. 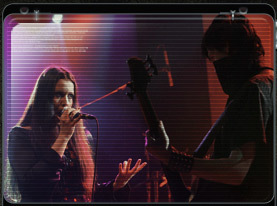 The festival, founded in year 2008 by the female association, presents metal bands from France and from other countries throughout Europe, that have female leading vocals. But as the organizers say, the key ingredient for choosing groups to perform on the festival is quality, diversity and originality. The festival will take place at the CCO in Villeurbanne, Lyon, on 17th of October. Group Aperion will be proudly sharing the stage with LEVES'EYES, STREAM OF PASSION and more. The doors of the festival will open at 6pm, the prices for the tickets in presale are 22€ and 25€ on the day of the event. For more information about the festival just visit their Facebook or official page. Aperion Group will be presented at the Exit festival. They will perform just before the group Kreator. See you in Novi Sad, on the 10th of July.